Hey everyone! Every week Club Penguin releases a new newspaper issue. In the newspaper issue they usually talk about new parties coming up or other things that are quite interesting. The prehistoric party is coming soon and Aunt Arctic tell us about the old language spoken on the island. 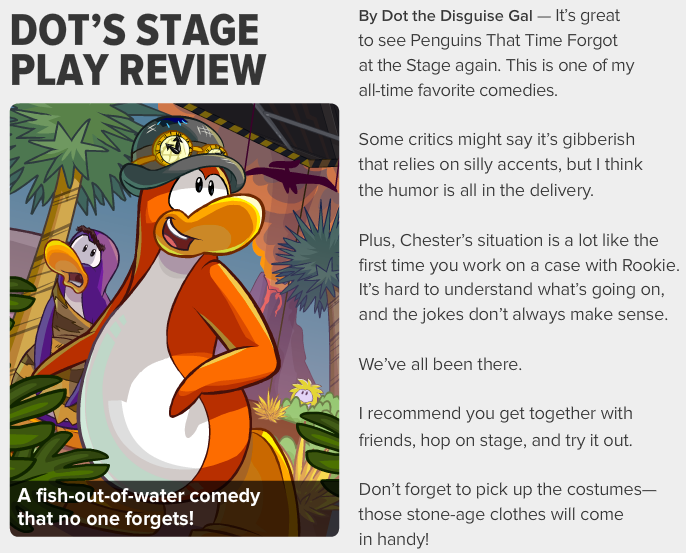 Next, Dot the Disguise Gal gives her opinion on the new stage called Penguins That Time Forgot. Go check it out at the stage. And finally we have the upcoming events section. We have the main event coming this month, the Prehistoric Party.